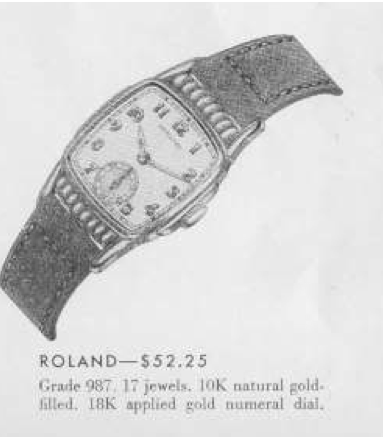 The 1948 Roland was only made for one year. I think one of the best parts of this watch is just saying the name, Roland, Roland, Roland, keep them doggies Roland. (No offense to all those Rolands out there). As far as the design goes, it has an interesting case. I don't know how to describe it... a bunch of rounded figures at the top and bottom between the fixed lugs. It's quite similar to another model from slightly earlier - the 1940 Russell, except the Russell has flexible lugs. Both models use the same crystal. You're going to find a 17 jewel 987A under the hood unless someone made a swap over the past 60+ years. 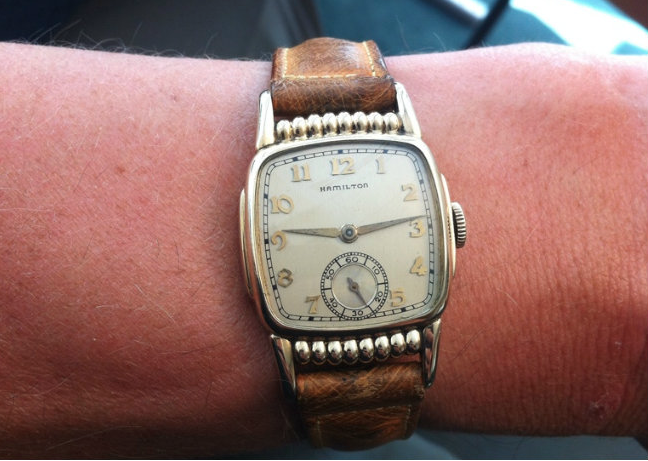 They're relatively easy to come by considering they were only available in 1948 and tend to wear a lot to the rounded ball-section of the front bezel, so getting a nice case is the key to this model. All cleaned up I think it's a pretty sharp looking watch, plus it has a fun name. Please how much this watch worth now days? If it's recently serviced and doesn't show a lot of wear to the bezel then it's probably in the $200-$250 range. It's a fairly common model. If it's not in good shape, considerably less.